Roll up your sleeves; there’s going to be some math in this one. Let’s talk about regression to the mean. Obviously a baseball player’s innate ability isn’t constant: He can be nursing a minor injury or learn better plate discipline. A lot of things can happen to change a player’s true talent level. Of course, the same can be said of taking a test, the typical use case of true score theory. A student can be well-rested one day, tired another day, for instance. When we refer to something as “true” we simply mean that it is repeatable under the same conditions. So what we notice is that when we observe something repeatedly, whether it’s baseball players or students, is those who did better or worse than the mean (or average) tend to perform closer to the mean as we add more observations. The first column is OBP in the first 100 PAs, the second column the number of PAs that group of players had after that, and the third column is the average OBP of that group of players after the first 100 PAs. (On average, each player had 393 PAs after their first 100, or 493 PAs in the season. What this table shows us is that the concept of regression to the mean seems to do very well in predicting how groups of players will perform in the future. Again, the group regresses to the mean: They put up a .365 OBP for the rest of the season. But again, some improved, and some did even worse than the mean. 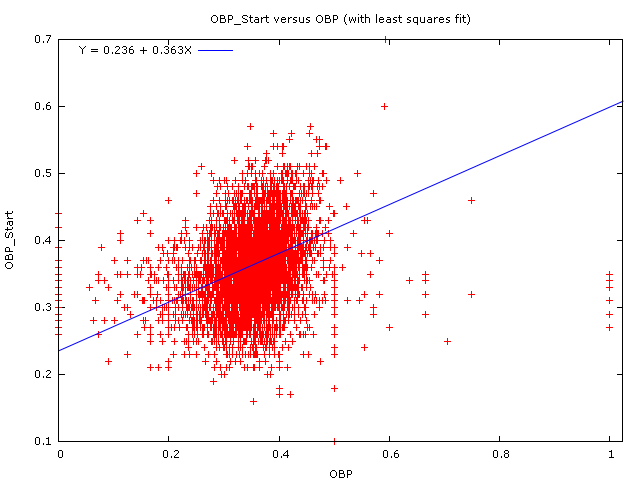 100 PAs of OBP simply doesn’t do a very good job of predicting future OBP. The answer is simply to use more PAs – if Pujols puts up a .320 OBP in his first 100 PAs, the question of how much he will regress to the mean will be almost entirely overshadowed by the fact that he’s Albert Pujols and he is the best hitter on the face of God’s green earth. Do we regress Pujols’ OBP? And since he’s Albert Pujols, and we have over 5,800 PAs of .426 OBP from him, we don’t expect him to regress toward the mean anymore, right? As the number of observations (in this case, plate appearances) goes up, random error goes down. In 10 PAs, one extra walk (or any other on-base event) is worth .100 points of OBP. In 1,000 PAs, it takes 100 extra walks to be worth .100 points of OBP. Errors become harder as the amount of observations go up. 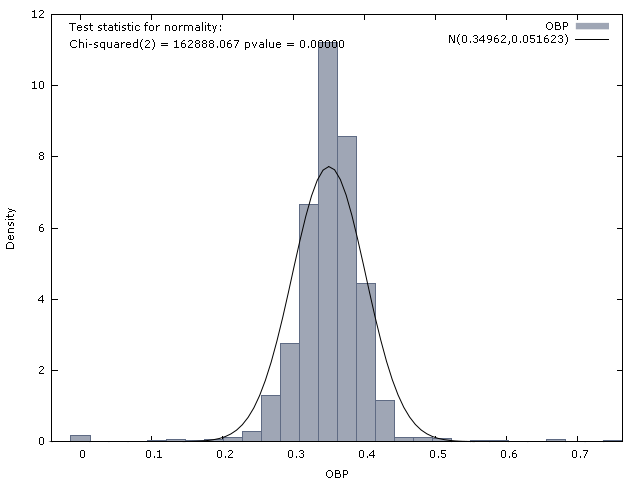 But so does everything else: both kinds of variance decrease as our number of observations goes up. When we say that Pujols regresses to the mean, we don’t mean that he’s getting worse. We simply mean that due to the limited number of observations we have a certain amount of random variance that we have to account for. Typically for a very large number of PAs it’s a small amount of regression (probably not noticable if you’re rounding to three significant digits), and since his peers are typically expected to regress by the same amount it doesn’t change our relative opinion of him. A funny thing happened on the way to the 101st plate appearance: Players who did very poorly tended not to make it that far, while players who did very well tended to get more PAs. There is a selective sampling bias here, in that teams allocate playing time based upon 100 PAs (as unpredictive as we assert that they are). Those players who tend to do poorly and still recieve playing time are generally either those who have done well in the past or who teams think are better players for reasons unrelated to performance to date, like scouting. Here’s a great article about regression to the mean that goes into the history of the phrase. Another great resource on the topic is here (even though it focuses on basketball, not baseball.) And of course I’ve written previously on the topic. The Sage Encyclopedia entry on reliability was a great help in preparing this article. Graphs were created using gretl. All results were weighted by the number of plate appearances in the second sample – in other words, a player with 300 PAs was counted twice as many times as a player with 150 PAs. Just taking a wild guess, I would say you would weight his 100 PA at “1”, his career 5800 PA at “0.40” (total of 2320 PA), and add in 200 PA of .356. That gives me a weighted average of .417. Now, if that’s all we knew, then that’s our best estimate. The result? .420. I’m not sure if everything works out the same as the PAs go down, but at least in the case of someone like Pujols either approach should give the same results. 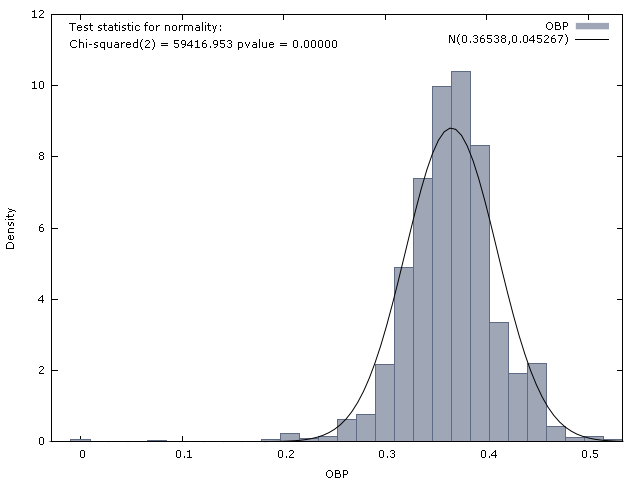 Best estimate of OBP = (0.426*5800+0.320*100)/5900 = 0.424. Therefore, the best estimate of his OBP for the next N PA is 0.424, regardless of the size of N. I thought this was Colin’s answer before he took off on a tangent that I didn’t understand. Ok, guys, where am I going wrong? Colin – So Pujols has a .320 OBP in his first 100 plate appearances of a season. And you know that the league average OBP has been .356 and that Pujols previous OBP in 5800 PAs has been .426. Show how you would predict what Albert’s OBP would be in his next 500 plate appearances (essentially the rest of the season). Colin, thanks for the link to The Book. It looks like a must read. Of course you’re right that the .49 would also just be an estimate of the SD since we don’t know the true OBP. Colin – it’s my first time posting (and reading) and I don’t know what “The Book” is, but where does .47 come from? Assuming you’re finding the standard deviation (SD) there, it should be sqrt(.424(1-.424))=.49, right? Also, why does the .356 estimate have a higher SD associated with it than the .424 based on only 5900 PAs? I’m looking forward to reading a lot more!